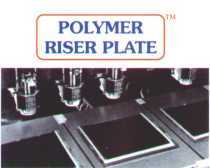 POLYMER RISER PLATE and HI-TECH POLYMER RISER PLATE are a phenolic based soft tooling plate. SUPER FLAT RISER PLATE is an epoxy coated phenolic based soft tooling plate.  Guaranteed ±.006" or ±.005" thickness tolerances.  Outstanding for small hole drilling and SMT "Z" axis cavity work. STAT-MAN Vacuum Collector Manifolds are designed for the new Excellon Mark VII drilling machines. STAT-MAN is adaptable to retrofit most most Excellon Mark III through Mark VI machines. STEALTH-MAN 7 Port Vacuum Collectors are designed for use as a low profile manifold for 3 to 7 spindle machines.  Efficiency, 60% area enlargement produces increases flow volume.  Adaptability, accepts two inlet hose sizes; .875" O.D. and 1.062" O.D.  Reliability, made of abrasion resistant conductive plastic, outlasts stainless steel.  Uses simple to intall hoses. STAT-VAC is a line of conductive vacuum hoses engineered as a direct replacement for Excellon and most other CNC drilling and routing equip.  Conductive, 250 ohms per inch.  Eliminates the need for ground straps and cables.  Lasts 15 X longer than original hose. TRANS-CHEK is a patented, first article and production drill hole check overlay.  Available in amber, green, and white, .006", .010" and .014" thickness. TRANS-VIEW is a clear film for dry film exposure machines.  Dry Film Exposure Vacuum frame replacement.  Durable Polyester Mylar® Film.  Available in .003", .005" and .007" smooth, and .004" embossed finish. SPECTRA-TUBES are fluorescent tube filters for yellow rooms without drop ceiling fixtures.  High tensile and impact strength.  Can be used over low cost white fluorescent tubes.  Available in gold, or clear UF.  Available in T12 and T8 sizes. SPECTRA-LITE lighting panels are for yellow room exposure areas.  Filters fluorescent light to gold safe-light.  Available in gold or UV filtered clear white. TRANS-TEST is a new technology clear plastic blank designed for use with all types of "bare board" testing machines. POLY-TEST os a polycarb test fixture blank available cut to size. Acrylic is available in many colors. Call for Quote. Polymasking rolls, Soft Tooling Plate Plugs, Dessicator Cabinets, Solder Pallets, as well as standard distribution plastics; Unclad G-10, CDM, Mechanicals.